Pomperaug's #18 Sarah Theriault bumps the ball during girls volleyball action against Weston in Weston, Conn. on Wednesday October 19, 2011. A never say die attitude helped the Weston girls volleyball team pull out a win Wednesday. Weston went down to the wire in its 3-2 (20-25, 25-20, 18-25, 25-22, 15-13) home win over Pomperaug, avenging its Sept. 15 3-0 road loss to Pomperaug. "It was an exciting match between two similar and evenly-matched teams," Lady Trojans coach Jamie Charles said. "We focused on playing consistent and solid volleyball." Remembering Monday's 3-1 loss at Lauralton Hall served as an impetus for Charles and her players. Against Lauralton Hall, Weston led 22-10 in the third game but lost it, 25-23, and it ended up losing the match. "It's never giving up and taking it one point at a time is how we need to focus," Charles said. "We were up 22-10 in the third game against Lauralton but they came back to beat us and proved anything is possible." The Lady Trojans, who raised their record to 6-8, 6-5 in the SWC, proved the exact same thing in vanquishing the Lady Panthers (10-6, 8-5). Weston took an 8-4 lead in the fifth and penultimate game after Fran Holmes (six service points, five kills, 24 digs) and lefty Taylor Swanson (12 service points, three aces, two blocks, eight digs) each served two service points. Swanson's second point was an ace. "I paid a lot of attention to my form and I've been working a lot on it in practice," Swanson said. "I listened to what my coach said, which was to imagine where I was serving it, and it worked out." Senior captain Jessy Gersh (11 service points, 35 assists, nine digs) set up junior Savannah Carpenter (19 kills, 19 digs, six service points) for two of the four points. 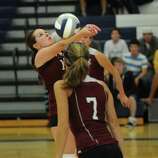 Pomperaug senior captain Allie Wallace's kill forced a sideout. Wallace (12 kills) pulled the Lady Panthers within one, 8-7, when she delivered a kill on senior Kirsten Makijczyk's serve. However, Pomperaug couldn't get the equalizer right away and pulled within one, 11-10, when 6-1 sophomore Kristen Urban (10 kills, eight blocks) delivered a kill at the net on junior Tori Tafuto's serve. Weston answered when Gersh set up senior co-captain Lili Clement's kill. Gersh made it 13-10 with a service ace. "Definitely a lot of focus because in serving, a lot of things can go wrong," Gersh said. Gersh experienced the pratfalls on the following serve when it went wide, which gave the Lady Panthers new life. "You got to have some bad serves from time to time," Gersh said. "It came at a bad time but you have to shake it off and focus on the next point." Senior captain Lauren Baranowski (17 service points, six aces, 19 assists) delivered two straight well-placed service aces for Pomperaug. The visitors appeared to have the momentum, and Charles called a timeout. "It's nothing I said to them, I told them to relax, and you have to work for your points," Charles said. Clement said, "It wasn't a matter of making adjustments, it was a matter of staying calm and focused. We needed one good pass to get it to the setter." The Lady Trojans handled Baranowski's next serve and Gersh fed Clement (11 service points, 15 kills, 18 digs), who delivered a basketball-pass style kill to force a sideout and gave Weston a 14-13 lead. "We had a timeout and talked about where to place it," Clement said. "We knew the middle was wide open and the most difficult place to cover. It was the best place to tip it." 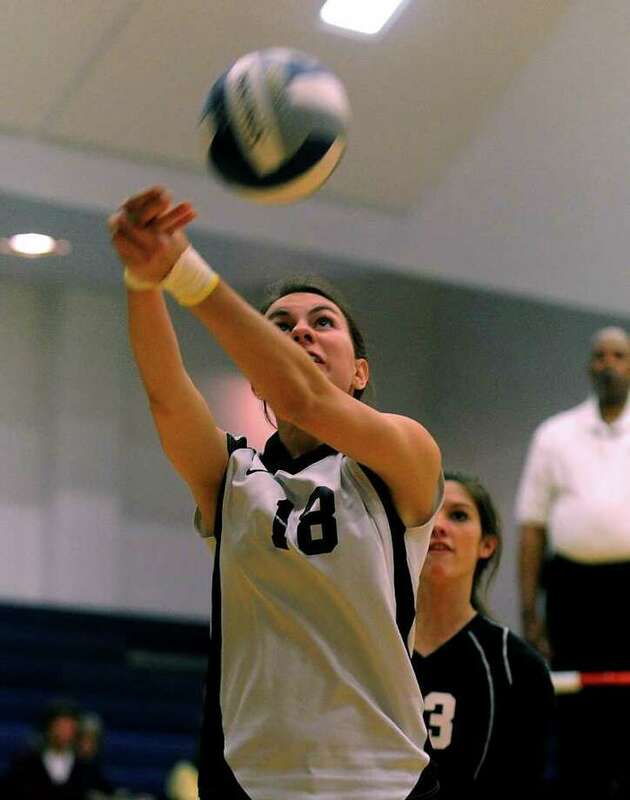 Gersh said, "I've been a setter since freshman year and I worked on finding them in the right spots. Clement then served the final point, which ended when Lady Panther senior Haley McDonald hit it into the net. "Towards the end, we wanted it," Clement said. "We got stronger and stronger and knew we could end it. We were energized." After falling behind 10-5 in the fourth game, the Lady Panthers tied it 10-10 after Tafuto served four straight points. Urban's dominance at the net secured two kills. Makijczyk served three straight points, one ace to give Pomperaug an 18-16 lead but after a poor serve, Swanson came back with three service points, one ace and Weston had the momentum the rest of the way. "There were times when I needed to get us the lead and I listened to my coach," Swanson said. "She said to be confident, focused and block everything out." Junior libero Sarah Theriault (29 saves) played well defensively for the Lady Panthers. Carpenter picked it up as hitting force in the fourth game. "The kills in the fourth and fifth game were pure motivation from the entire team," Carpenter said. "All the energy that was on the court was building up to enhance my power." She made defensive plays all match. "The shots that were coming to me we're so fast and a bit scary," Carpenter said. "I stuck out my arms of where the ball was going to go and hoped for the best. The other shots I really concentrated on moving me feet. Coach always tells us to beat the ball there and that was my goal." Holmes was also a defensive force. "In the back row, it's important to stay stable and to wait for anything that comes your way," Holmes said. Junior Anna Hengelbrok (seven blocks, one kill) was a force in the middle and classmate Sydney Weiss delivered three clutch service points. Senior Morgan Murray (nine digs, one service points) played well defensively. "It was a crazy and amazing night," Gersh said. "To win in five games and the last one 15-13 shows we've mastered what we've been working on, which is finishing games."